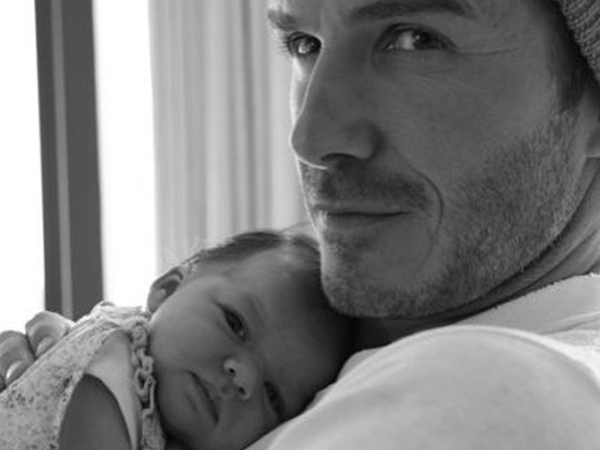 David Beckham has posted a touching birthday message to Harper. His and Victoria's youngest child turned four today, marking a big day for the parents and older brothers Brooklyn, Romeo and Cruz. In a touching Instagram message, the former soccer player posted a picture of himself with a tiny baby Harper on his arm. "Possibly my favourite picture of Harper of all time... 4 beautiful years with the most amazing little girl... Happy birthday big girl... (sic)," he captioned the shot. It's clear the sportsman and his designer wife are besotted with their offspring and are often spotted enjoying days out with their brood. That's despite little Harper sometimes being a little too honest with her father. "My little girl turned around to me the other day – I had just bathed her and I was towelling her down, and she said, 'Daddy I love you so much. But I don't like you, you're so chubby.' I mean, I didn't think I was," he recently laughed to talk show host Jimmy Kimmel. The family lived in the US when David was playing for LA Galaxy but moved back over to the UK in 2012. Since he's retired from the pitch, things have changed a little. "I've become a taxi driver overnight with the kids," he laughed. "I'm literally an Uber driver. I take them from seven in the morning to schools, I have four drop offs, four different schools."